Another busy weekend as the school year winds down. It was 8th grade picnic for our family, class night for my school, a cookout with friends and family, and a dinner for the exchange students in our Rotary district. It was a lovely, busy weekend in which I took no pictures. I need to work on that. 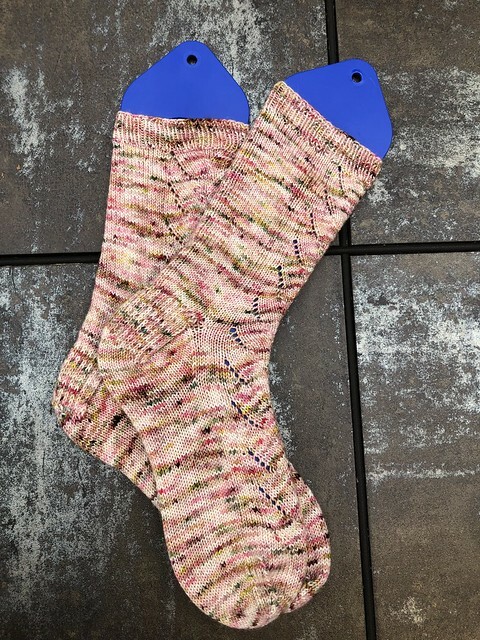 I did finish my Will O’the Wisp socks (Ravelry pattern here) and it was bittersweet. I love this pattern and enjoyed knitting it to the point that I didn’t want to finish it. That must be a first for me. The yarn is Christmas at Hogwarts from A Homespun House. Molly’s shop is now closed while Molly and her family relocate to the US from Germany, but I did buy three skeins to tide me over.